For men diagnosed with prostate cancer, deciding on whether to opt for radiation treatment or have their prostate gland surgically removed can be difficult. Surgery to remove the prostate gland (radical prostatectomy) and radiation therapy are two of the most commonly elected treatments for prostate cancer. Both treatment options are associated with a variety of potential complications and side effects but robotic prostatectomy has a host of benefits with far fewer side effects associated with radiation therapy. The surgery is performed by a trained and skilled surgeon through the use of a computer-enhanced robotic surgical system. Instead of the large incision used in open surgery, da Vinci surgeons make just a few small incisions – similar to traditional laparoscopy. The da Vinci System also features a magnified 3D high-definition vision system and special wristed instruments which precisely translates the hand movements of the surgeon. Brachytherapy (Internal Radiation Therapy) – This procedure involves making an incision under general anesthesia to implant pellets into the prostate gland that release low doses of radiation slowly over a period of months. About 40 to 150 rice-size seeds are implanted, and they lose their radioactivity over the course of a year. External Beam Radiation Therapy (EBRT) – The prostate gland is targeted with beams of radiation (X-rays or Proton) from outside the body . It typically consists of five treatments a week over the course of an eight-week period and can last 15 to 25 minutes to complete without the need for anesthesia. 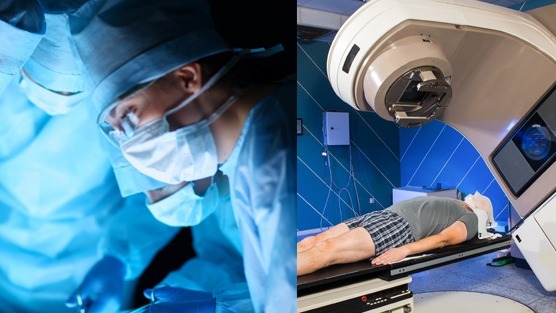 A past study in the Lancet Oncology Journal also showed that radiation therapy complication rates were 2- to 10-times higher than complication rates in men who were treated with robotic prostatectomy. The most decisive plan of attack for localized prostate cancer is surgery. For most men anything else, including radiation, is less targeted, less effective, and less definitive. Surgically removing the entire prostate also allows for more accurate staging and grading. This allows your doctor to create a better long-term plan of care. Radiation can however still serve as an option for patients following surgery to further treat prostate cancer if more treatment is required.